The list of completed projects reveals many years of experience and professionalism in handling with various types of orders. Quite often, the words “objectives”, “mission”, and “vision” make bare words on a company website to demonstrate the respectability of the company. We have attached a deeper meaning to these words though. They have been created by our whole team and subsequently have become the foundation of our company that influences the entire decision making process. The given foundation serves all actors, particularly our customers and partners, and naturally our employees, the team members. Our Values. Our customers, partners and team members make the core of our values. 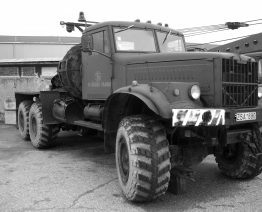 They are the drivers of our operation and performance. Trust. We are aware that we cannot create a reliable and professional company without trusting each other. Therefore, the question “Can I trust you?” is essential for each newcomer to the team. Trust is underlying all other values and goals. Trust between partners and customers means that, in any event, together we will find the best solution. Self confidence is none the less important since only a self-assured person can be a creator. Self confidence comes with knowledge, professional expertise, straight talks, encouragement – all of which we try to provide to our employees. Goal Pursuit / Objectives. The goal pursuit culture and perception of what each of us must do to achieve the goals both, short-term and long-term, personal and collective, have dominated our company. We realize that the best possible result can be achieved only by becoming professionals and helping each other in pursuit of the company objectives. Professional Expertise. Becoming a professional is the only way for each of us to create a professional company accordingly we continually improve our professional skills. Professional expertise is a powerful tool in creating more value for customers, offering the best solutions to improve business processes, and saving time and money. Professional expertise represents our approach to values, people, processes, and everything we do. Loyalty. Realizing that loyalty is one of the core values​​ we aim to establish conditions under which employee loyalty to the company can be increased. We strive for sustainable partnership and loyal relationship with our customers and suppliers. Our decisions are based on long-term partnership consequently loyalty shall be considered the essential vision of the company. Respect. We have respect for the country where we live, including its legislative framework and tax regime; we have respect for the rules of business and freedom to express individual opinions; we have respect for our employees, customers and partners. We enter every new country showing respect for its culture, mentality and tax policy. To contribute to building a better world. To offer the most professional solutions for construction and industrial applications to our customers and partners. To become an effective company based on a long-term partnership with employees, customers, and partners. The founding year of the predecessor of the company formerly known as Šiaulių kranai. 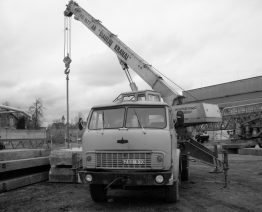 The company hired mobile cranes and tower cranes to builders working within the confines of Šiauliai region. Transfer of the ownership of the business to the logistics company Transimeksa UAB. In addition to CRANBALT, the company owns Vilniaus Transimeksa, Sulinkiai, Specializuotas transportas, Baltcargo and other companies (2017 Cranbalt and all other copanies owned by Motus Novus holding, turnover in 2017 reached 74 mln. euros). Opening of a new page in the history of the company – the company replaced its name with CRANBALT AB and changed its business strategy shifting from a local company to the Baltic and Nordic market participant. It was decided to invest in continuous staff training, innovation, and machinery rental fleet. Manufacturing of industrial cranes launched by CRANBALT AB in partnership with TEREX Demag. The customers have been provided with professional solutions in the field of manufacture of cranes ever since. 2013: The founding year of the KranBalt OOO subsidiary (Kaliningrad, Russia), supplier of tower crane rental services to major construction companies in Kaliningrad region. 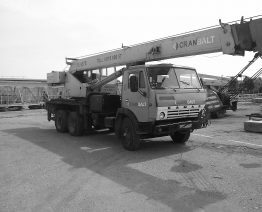 2014: The founding year of a Latvian branch the CRANBALT AB subsidiary (Riga, Latvia), supplier of tower crane rental and production services to local construction companies. 2014: Signing of the first contract with a Swedish company. The first tower crane erection in Stockholm by CRANBALT AB. We have all documentation required for carrying out business activities.